A proper deambulatory recovery has as its basis a proper proprioceptive systems strengthening that are activated only with the support of the foot on the ground, region of the body that trasmits the most information on the balance as the basis for a correct posture and the consequent control of the relationship between thigh/leg/foot. We can say that a limb with a stable postural balance, allows the development of an appropriate dynamic activity. The foot is the region of the body that transmits the largest numbers of proprioceptive information indicating instantaneously movements that the body is making. The main proprioceptive receptors are located in the arches of the foot (trasverse lateral and longitudinal) and particulary in the front of the heel, under the head of metatersals , under the big toe and in the eumbrical muscles of the foot and are solicited on the basis of the degree of deformation during the support. This function is crucial for balance and a proper posture and the consequent control of the reltionship between segments thigh/leg/foot. Analyzing in more detail the step, we can break it down in a dynamic phase of ground contact and in an air phase. In the dynamic phase of ground contact, the advantages of the Ktj device through pins junction , determine a weight discharge which burden on the knee greatly reducing (or even disappearing) pain in the support. In the air phase, instead , the angle reached in the call leg on the anterior-posterior plane ( 45-50° ), guarantees the return of the instantaneous center of rotation (which does not happen using a fixed center brace). Also this function tends to avoid onset of pain and as a result the interruption of flexion of the leg on the thigh so lameness ; in the air phase or in the tilting of the injured leg forward, the leg itself is unable to bend over 30° to shorten the distance from the ground so that the foot does not impact with it . Instinctively the propre deambulatory action changes : the injured leg remains semifolded if not almost rigid, while the foot of support is forced to extend more to increase the difference in height of the center of gravity from the ground. Considering that the nervous system is able to perform movements already known (carried out automtically as deambulation), and to learn new movements to adapt to perform complex gestures, which are "designed " with the creation of brain representations of learning called engrams , that allow an anticipatory decision-making mechanism(feed- foward) with respect to behavior in motion that is being implemented. 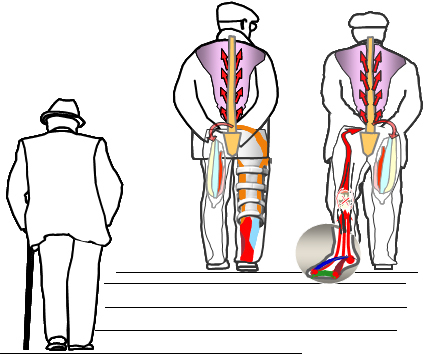 On the basis of the above, we can understand how a wrong movement (lameness), if repeated over time,may lead to the strengthening of a deambulatory engram changed from the existing, so offsetting the fluidity of the walk bacause this will be acquired as correct and repeated (proposed) as reference model. In the consideration that correcting these movements parasite determined mainly by pain in deambulation,especially in the elderly, is particularly difficult, it is very important avoid their settlement. Studies of Dr. Zadini focused on the disappearance (or alleviation) of pain; In her work: "The variable rotation center knee-pad : assessment of gate and ADL in patient with gonarthrosis operated for lower limb arthroprosthesis" , she concluded saing that: "the use of a knee brace with variable center of rotation must be between treatments of first choice in the managment of knee arthritis. Our results confirm the hypothesis that a knee brace with variable center of rotation promotes the recovery of a good level of autonomy in activity of daily living without causing unnecessary stress on the ligamentous and facial structures of the knee. The device also determines immediate pain reduction and an improvement of balance and of deambulation resulting in reduction of the risk of falls. The considerations listed above come from observations made on a population of elderly which with various degenerative diseases (chondropathies, arthritis, servevalgus, ecc.) , have immediately realized significant benefits recovering to deambulate quickly. These benefits are attributable to both the mechanical support offerd by Ktj brace , and the proprioceptive recovery determined in first place from the support of the foot "safer" and amplified by cutaneous sensory system. As explained in more detail, proprioceptive system which chairs the postulate equilibrium, has as basis the nerve sensory references present in articular organs (Corpuscle of Ruffini - proximal joint capsule, Corpuscle of Pacini - Capsule, synovium and distal joints, Corpuscle and ligaments) that cooperate synergistically with the skin receptors of which also belong the spinal nerves that have a dual function : the posterior root (dermatome) develop the sensory/proprioceptive action while the front root (miomero) develop in motion action. In lower limb dermatome and miomero overlap; It follows that a local pressure produces an immediate response of the muscles group beneath the covered area. When a limb is fixed to a knee brace this overlaps with areas of skin that can be highlighted by the diagram below. So we can understand how a possible imbalance recorded during deambulation inevitably produces pressure on sides that are "transmitted" from sidebars and "felt" by sensitive skin areas. These pressures are transposed from the dermatome and immediately processed for a correction of the movement by the miomero. The special motion of Ktj brace helps the sensitivity of perception of skin to be free from interferences determined by friction between brace and skin, due to the perfect parallelism between the mechanical motion of orthopedic and the roto - translational of the knee. From the consideration that the use of the brace is recommended in case of injury to a joint (organ), inevitably accompained also by an injury to nervous/proprioceptive references, we can consider sensory/skin stimulation as a "proprioceptive amplifier" to replace the torn , to strengthen the possibility of a proper foot support with the subsequent maintenance and improvement of postural balance. The deambulatory recovery of the elder is not only a form of autonomy , but also one more chance against loneliness and isolation . The possibility to return to deambulate creates a chain of benefits to the articulation itself, which is increasingly intensified when the movement becomes more quantitative.